Planning to tie the knot? As a former wedding florist, I know how stressful wedding planning can be. Add in budget woes, and stress levels start to skyrocket. For example, couples spend an average of $14,000 on their reception venues, and another $1,900 on a ceremony site, according to a survey by The Knot. That’s nearly half of the average wedding budget! Ouch. A little resourcefulness can drastically reduce your wedding expenses, and the cost of the venue is no exception. Don’t be shy: If you’re serious about cost reduction, you need to be inquisitive. Ask about all the options you can think of, then bring your plan to life. Check out these awesome free or low-cost wedding venues. 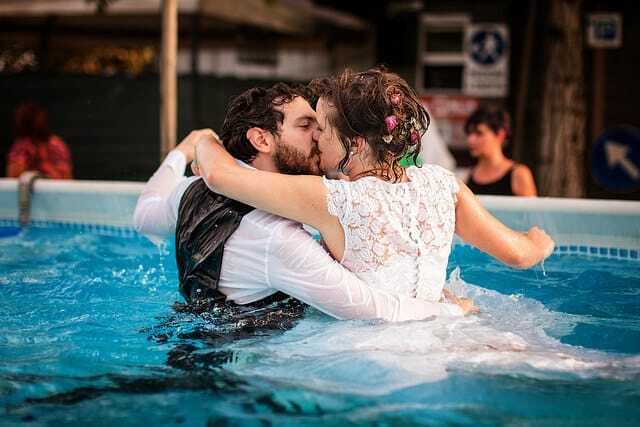 If you know someone who owns a pond, ask to host the wedding there. You can ask friends to help prepare the grounds and, with permission, provide small fishing rods to keep children busy. For safety reasons, consider posting a “No Swimming” sign. One clever bride rode to the pond on a horse, and then kept the horse for the reception so children could take rides. It’s great when one idea can pull double-duty! Another couple married on a pond with a small dock. As the wedding party entered, a family band played for guests. With simple decorations and flowers, they cut their costs significantly. Does your neighbor have a barn? Ask if you can use it. A barn might require deep cleaning and possibly a coat of paint. The aisle could double as a ceremony location — and then a buffet area — and decorated stalls can hold guest tables. Don’t worry; horses will only add to the scenery. If you don’t want the ceremony in the barn, you can marry in a nearby pasture and save the barn for the reception. A friend married in her pasture, with a backdrop of her barn. With a rented arch and aisle formed from close-cut grass, a simple, quick ceremony was frugal and fun. Lights and candles enhanced the reception mood, and the barn was only a few steps away. Think wildflowers and gorgeous views; it’s spacious with lovely pictures to boot. All you need to do is mow the lawn and do some light decorating for a beautiful event. One bride chose her parents’ field. With a gorgeous view and a lake in the distance, it was beautiful. Guests could walk to the ceremony site or hitch a ride on decorated farm equipment. Buffet tables and champagne were just feet away. Tip: If you go this route, have a quick ceremony and skip chairs; chair rental is pricy and labor-intensive. Have a friend with a nice pool? This can be your ticket to a low-key, low-cost event. 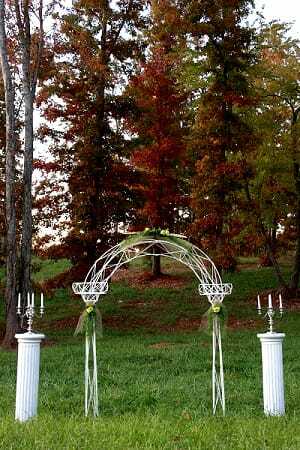 Rent an affordable arch and have a simple ceremony. Then, walk to your reception by the water. One couple used their friend’s lavish pool with multiple waterfalls. A rented arch, Christmas lights, flower-filled Mason jars and a few tables and chairs rounded out the location. Throw in some floating candles, and you’re set. Want a huge waterfall for a backdrop? A state park might be your answer. Some parks require reservations and special permits. Entry fees are free, or as low as $5. Pick a park and contact them to learn more. Most parks are open throughout the year, even on holidays and weekends (though you might want to choose a weeknight so the park’s not packed with strangers during your ceremony). The downside to hosting your wedding in a park? Many might not allow decorations to be attached to their property (such as rocks and trees). The plus side? You’ll save on decorations! 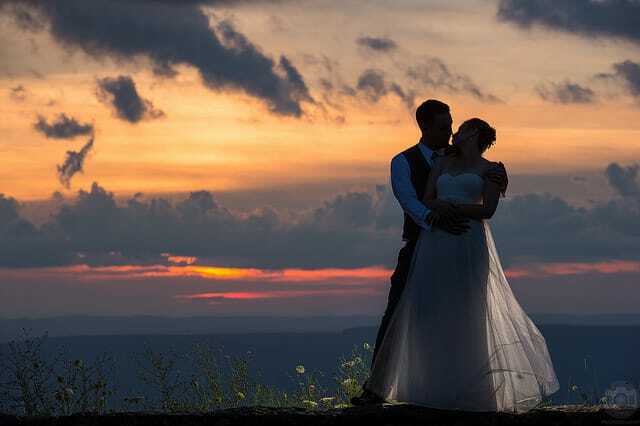 One thrifty couple married at their local South Mountain State Park. They held their ceremony in a spot flanked by towering trees, friends and family. Afterward, they enjoyed a family-donated Southern feast in the picnic area. With no additional charges, free admittance and minimal decorations, they saved a ton of money. Note: There was no fee to use the park’s amphitheater; however, they did need to get a special activities permit. Each park will vary. 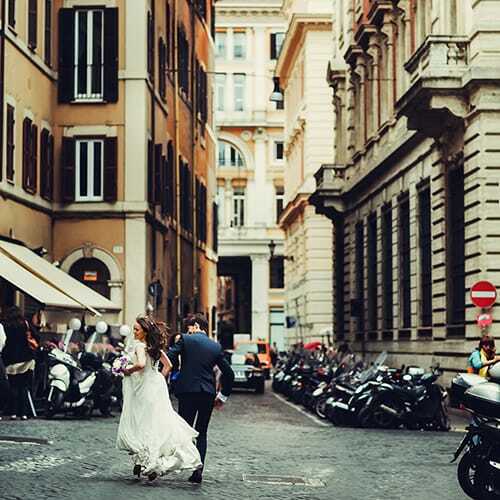 If you book a restaurant for your reception, your city may allow you to block off a street for your ceremony. As a special option, it may require a fee and permit. Plus, if you notify them ahead of time, the local newspaper may even cover your celebration. What a cool memento to show your grandchildren one day! My mom’s friend got married in front of a Florida courthouse surrounded by restaurants and nightlife. After a simple ceremony, they walked across the street for dinner, then enjoyed the nightlife at a nearby brewery. It’s cheap for you, and the city benefits from the exposure. Many cities charge by the hour, and rates will vary. If you met in college, why not take advantage of the school’s stadium? It may require a board meeting, but don’t let that stop you. Schools love supporting their alumni, not to mention free publicity. Policies vary, and some may not allow festivities on expensive turf. Inquire at your school to see about the rules. You have other options at your alma mater, as well. At Gardner Webb University in Boiling Springs, North Carolina, couples can marry in the chapel, in the rose garden or by the pond. They just need to pay a small housekeeping fee ($40 to $200, depending on venue), according to a spokesperson. Do you know someone with a large foyer and gorgeous staircase? It may require an intimate ceremony, but if that’s what you’re planning, then ask away. 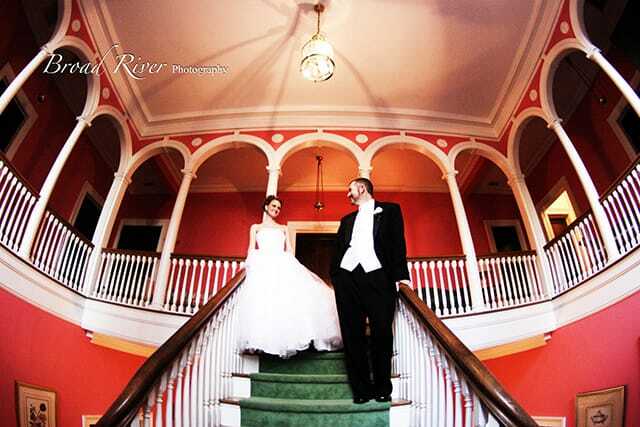 Picture yourself descending the stairs, then heading to your favorite restaurant for the reception. Better yet, head to the airport for a tropical honeymoon — you just saved big bucks, after all! 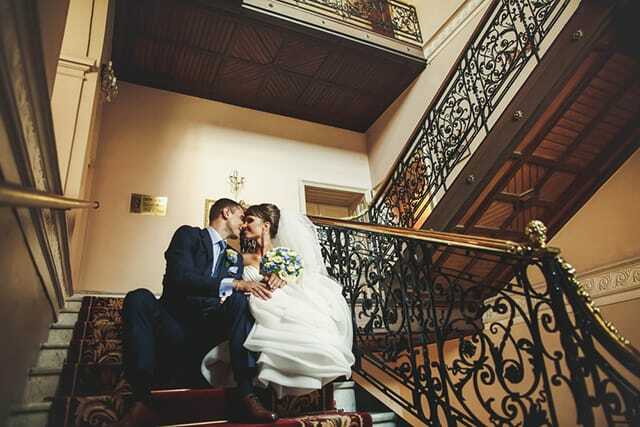 My grandparents had a beautiful foyer, which is where my sister married. She dressed at a neighbor’s house across the street, and, flanked by two bridesmaids, used the front walkway to enter the foyer. Simple decorations included two large arrangements on the front porch, a bouquet for her and boutonniere for the groom. My parents saved a ton of money with this option. 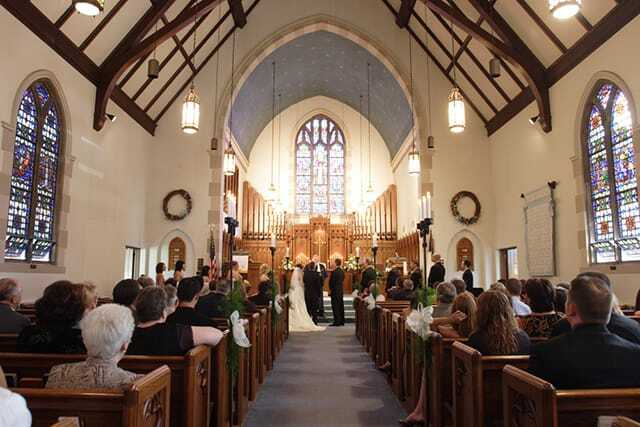 If you’re dead-set on marrying in a church, many will let you use their sanctuaries and fellowship halls. Some churches charge fees for use or cleaning. If the latter is the case, ask a family member to become a janitor for a day, and the church might waive the fee. Be willing to negotiate. And if your favorite church is too expensive and won’t budge on price, move to your next choice. Some churches require you use their in-house director for an additional fee. Be wary. Before you sign the contract, let them know you have your own director. Then, enlist a family member or friend to help you manage the ceremony. A friend’s daughter married in her church, with the reception in the fellowship hall. Not only was it free, church members helped with decorations and food. She saved money, it was beautiful and the homemade food was delicious. With creativity and an open mind, it’s easy to save on your wedding venue. Be willing. Be creative. And have less wedding debt afterward! Your Turn: Would you get married at one of these venues to save money? Kelli H. Clevenger is a freelance writer from North Carolina. She is the former owner of a wedding floral business, pet-grooming business and weight-loss consulting service. She has a long bucket list and plans to write about it all.